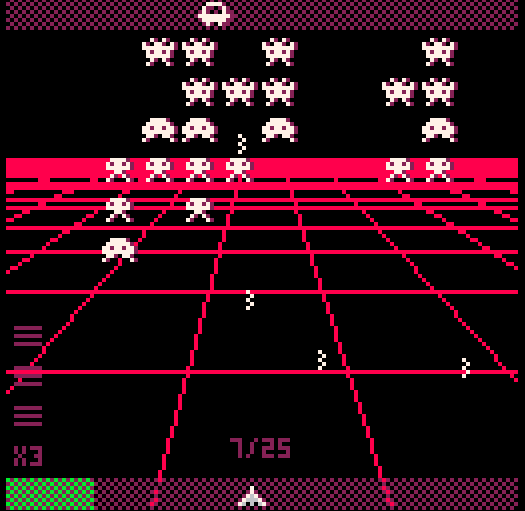 Indie Retro News: Invader Overload - Space Invaders just became even more wicked on the Pico-8! Invader Overload - Space Invaders just became even more wicked on the Pico-8! Now here's a blast from the past, a game based on probably the oldest mentioned game on our site ' Space Invaders '. Released in 1978 as an arcade shooter developed by Tomohiro Nishikado, your task was to defeat waves of aliens and earn as many points as possible, while trying to avoid being shot at or touched by the slowly lowering waves. This game however ' Invader Overload ' which is based on that classic and released on the Pico-8 by morningtoast, takes Space Invaders to the next level of awesomeness! In Invader Overload the gameplay is very similar in that you need to destroy the alien waves, just like in Space Invaders. But what makes this so much better isn't just the music, but the added weaponry power ups and the nifty Pico-8 graphics. So if you end up shooting the aliens for maximum points certain power ups are dropped, if you pick them up in sequence you could even end up with a beam weapon, upgraded laser or something else! What a fantastic game indeed that even has a cool soundtrack, so load it on your Pico-8 or if you want, play it in your PC browser!